Appearance: Dark burgundy. Not much effervescence after the pour. Nose: Wild blackberry, sandalwood, hint of honey and citrus. On the palate: More lively than expected. Medium sweet and spicy. The blackberry is front and center, but the clove slowly builds in strength until it takes over my whole mouth. The orange peel is a background balancing note. Finish: Tart berries with an orange peel body guard with the clove doing the same slow sneak attack thing it does on the palate. Like a vampire. Or something. Parting words: This is the second of B. Nektar’s horror-themed fruited & spiced meads I’ve tasted. The first one was mango and black pepper(with an Evil Dead tie-in. I love that flavor combo but the mead I did not love. It was good, sure, but the pepper didn’t come through and the mango only came trough enough to offset the bitterness of the honey. Not much different than their Orange Blossom mead. I was disappointed. This is a much more successful product. Nosferatu (one of my favorite horror films) is the cover star this time. The label blurb is chock-full of cheesy vampire jokes (“CAUTION: Keep away from sunlight. Product will not sparkle in sunlight”) but the bottle is full of tasty. One of the things I admire about B. Nektar is their willingness to try just about anything. Not every experiment works but you never know if something will work unless you try, right? 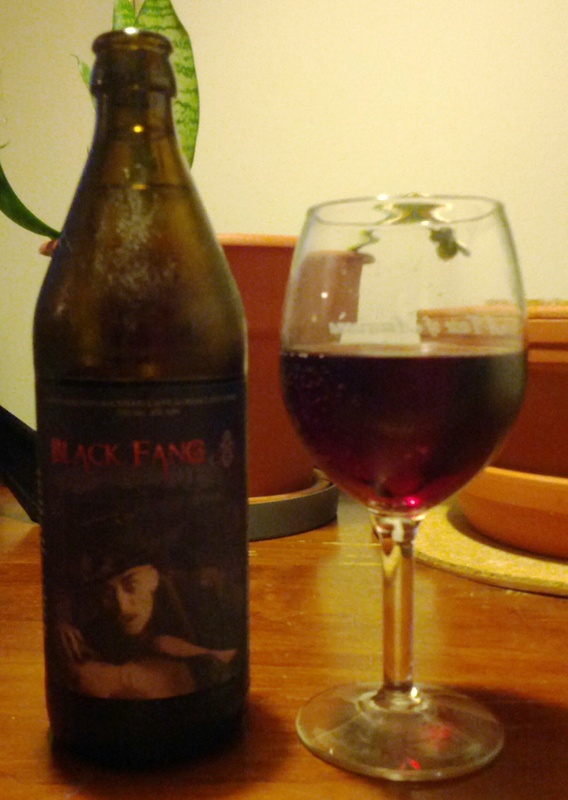 Black Fang (at about $8 for 500 ml) is recommended. Ha! Somebody’s in trouble! I hope you can grab another one for your sake and his. It’s really tasty! I think you should! This line of meads they have in the 500 ml bottles are very accessible and tasty.